Halifax have signed Huddersfield’s Academy international prop Tyler Dickinson on a month’s loan. 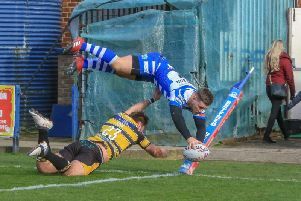 Dickinson, who played under Fax boss Richard Marshall in last year’s 1-1 series draw against Australia, could make his debut in Saturday night’s Summer Bash derby against Bradford at Bloomfield Road (7.0). The 19 year old, a former Siddal junior, has been a standout performer for the Giants’ Academy line up. “Halifax are a side with top four ambitions so the pressure is on every game for them to get the vital points and Tyler will be a good addition for them,” said a Huddersfield spokesman.